We here in America have been graced with the Asus Transformer Pad Infinity for about a week now, although it was a long road to that release. First, we saw a leak from Best Buy which claimed the tablet would be released on July 16th, but that page was quickly pulled. We also saw a leak from Office Depot on July 14th claiming the tablet was available for purchase, but it wasn't. And, we then it finally was made available on the 16th. Consumers in the United Kingdom have been waiting extremely patiently, and now have been found to be worthy of not just a release date, but a price as well. 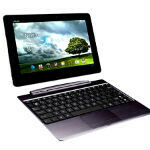 Asus UK announced today via Twitter that the Asus Transformer Pad Infinity will be made available on August 31st. The tablet will be sold with 64GB of storage, and the keyboard dock bundled for £599 (~$930). That's still a pretty long way off, and a lot can happen in the Android world in the 5 weeks before the Infinity is released in the UK, but it still should be one of if not the best 10" powerhouse tablet available. Maybe the tablet will even launch with Jelly Bean, but we wouldn't bet on it.